History of d-lusion. Rubberduck help - Features, Requirements, Installation. dual oscillator model including "morphing"
in order to run RubberDuck, you will need at least a pentium with 100mhz running under windows95/98 or windows nt 4.0 with a soundcard supported by the system. your graphics should support 16bit colors (65000). RubberDuck will only take about 3MB of your precious hard disk space. Execute the Setup Program and install Rubberduck on your computer. if you might ever want to deinstall Rubberduck (although we can't figure out why you would :)), use the provided uninstall.exe. before you can use RubberDuck the first time, you have to check the sound device setup in setup/sounddevice setup. determines the audio driver that RubberDuck uses for sound generation. the wave mapper device that windows uses to map audio devices. use this option if you often change your soundcard driver in windows. the normal soundcard driver that came with your soundcard. the directx soundcard driver. due to performance reasons you should use this driver if possible. you can get directx drivers for your soundcard from the vendor or microsoft. please make sure that directx is installed on your system before selecting this option. 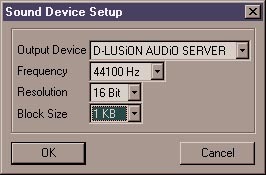 the d-lusion audio server is a tool to synchronize several d-lusion products running at the same time (for example a set of two RubberDucks and one DrumStation). mixing frequency for the RubberDuck sound-generation. you will use 44.1kHz to achieve CD quality, unless your soundcard doesn't support it or you want to torture yourself. the resolution of the generated audio data. usually 16bit. the buffer size determines the size of the output buffer. if you use a smaller buffer, the time between the movement of a fader and the actual reaction of the sound generation gets shorter. unfortunately this highly depends on the soundcard driver you are using. if the buffersize gets too small, you will hear a stuttering noise in the sound output. it is best to reduce the buffersize to the smallest possible size without getting a stuttering sound. if you enable the button "modulate" behind the specific modulation target, the values will be interpreted as relative, not absolute values. choose the midi input driver to control RubberDuck via a midi keyboard, external sequencer and other midi gear. defines the midi channel on which RubberDuck receives data. if it is set to "omni", data will be received on all availible channels. controls wether or not RubberDuck will react to midi program changes. a program change will be interpreted as the number of the next pattern to support pattern changes via a sequencer. RubberDuck can be used as midi slave with other midi gear like drum machines, sequencers etc. the quality of the synchronization highly depends on the buffersize. 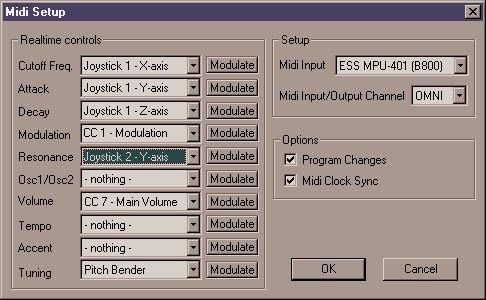 if you want to use RubberDuck together with other d-lusion software such as DrumStation, we suggest to use DAS for synchronizing. for more information about using rubberduck with midi gear, see the midi implementation chapter.